I bought a couple of fresh Halibut fillets to make some crunchy deep-fried fish pops recently. I find that this is one of the best ways to get my kids to eat fish. Whenever it comes to deep-frying fish or shrimp pops, I prefer to use Panko (Japanese breadcrumbs). Besides tasting better than the usual breadcrumbs, it’s also airier and crispier in texture after the deep-frying. Try it and let me know if you agree. In addition, I also prepared a wonderful Tzatziki dipping sauce to go with the crunchy fish pops. Great combination, try it! In a large bowl, add the breadcrumbs, sea salt and black pepper. Season the breadcrumbs mixture well and mix until well combined. To fry the fish and pepper: Toss the fish and pepper into the flour and shake off the excess flour. Then dip into the egg and then into the breadcrumbs mixture, making sure to cover the entire fish and pepper. Fry in batches until light golden brown in color. Serve the fish and pepper with the Tzatziki sauce and some lemon wedges on the side. I've never tried panko breadcrumbs, but I do have a long and convoluted method of making my own breadcrumsbs which involved drying slices of bread in a low oven, putting them through a food processor and then drying them again. Believe me, it works, but there are more convenient methods. Yum! 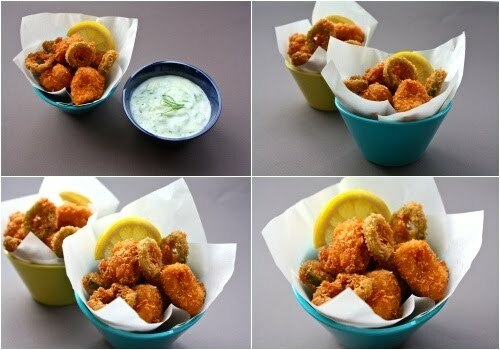 Not only did you fry fish my favorite way (with panko bread crumbs) but you also fried jalapeno slices?! Double YUM! I am a huge fan of panko breadcrumbs and use them when frying too. I agree that they create a much lighter, crunchier texture after frying and that is what we're going for when we fry things right? Wow, everything looks delicious! Such great photos too! That looks scrumptious. It's like eating popcorn. I love the sliced jalapeno fried with the fish, and the tzatziki sounds fantastic! @them apples: Well, your method sounds pretty good to me. I might just make my own breadcrumbs. Thanks for sharing the method. @Deseree: Ha! Glad we both have the same thought on frying with Panko breadcrumbs. @Cindy Khor: Yes, they do taste better than chicken.